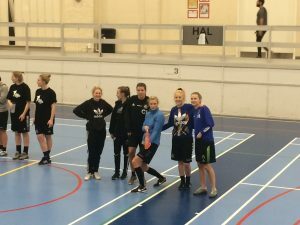 On January 14th, twelve girls from the football women’s first team played the indoor tournament Nytårscuppen in Nørrebrohallen. It is an annual event hosted by Boldklubben Heimdal with three different series – men’s, women’s and mixed. The girls met early in the morning to be ready to play. They split into two teams – Goal Diggers and De Gyldne Damer were born! Both teams won and lost games in the group stage, however it was only the girls from Goal Diggers who advanced into the semifinals after winning three games and losing one. Goal Diggers lost the semifinal but won the consolation game and therefore ended 3rd. The prize was a bottle of alcohol – only in Denmark! There was a lot of waiting time throughout the day but the girls were well prepared with food and snacks. And of course, the time went a little faster with cheering for the other team and small talks with the teammates. Thanks to the Sport Pool for funding the participation – the girls are looking forward to playing Nytårscuppen again next year!